Showing 1 to 3 of 45 posts. 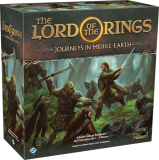 Fantasy Flight has announced The Lord of the Rings: Journeys in Middle-earth, another card game set in Middle Earth 3rd age. Why should we care? Well first of all, it's Fantasy Flight. Second of all, it's Lord of the Rings. Joking aside, the game looks solid from where we sit; a Mansion of Madness meets Lord of the Rings situation, which can be nothing else than awesome. Forgotten Circles, an expansion to the extremely hyped game Gloomhaven is hitting the stores this spring! The expansion features twenty new scenarios that take place after the events of the original Gloomhaven campaign and involve one new character class — the Aesther Diviner — and her attempts to prevent an approaching calamity. The accompanying scenario book breaks these scenarios up across multiple pages to create more dynamic and surprising encounters. CrowdOx has a preorder campaign here. The sequel to the great adventure Waterdeep: Dragon Heist is finally out in there stores.